Hebrew is an ancient language that was spoken over the course of many centuries in the land of Israel and was subsequently preserved by Jews throughout the Diaspora as a medium of cultural and religious expression. With the rise of Zionism and the State of Israel, the Hebrew language was revived as a spoken tongue and enriched by many new terms and constructions to reflect the reality of modern life. Modern Hebrew draws on all of the previous historical layers of the Hebrew language. New meanings are ascribed to ancient words and new words are created in line with patterns and paradigms native to the ancient tongue. As is the case for all languages, Hebrew has also absorbed some modern terms from other languages. 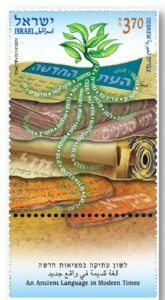 The Israeli government has decided to honor the Hebrew language by issuing a stamp that highlights Hebrew’s uniqueness: its continued existence even after it ceased to be spoken, the treasures that were added to its vocabulary throughout the ages, and its modern revival as the everyday language of Israel. Biblical Hebrew provided the most basic words, such as adam (man), yom (day) and mafteah (key), as well many abstract terms such as ahavah (brotherhood), deror (liberty), and emet (truth). Mishnaic Hebrew is the Hebrew used in rabbinic writings such as the Mishnah (a legal code) and books of biblical interpretation. It too was originally a spoken language, a dialect somewhat different from, and later than, standard biblical Hebew. From it came a number of new coinages, some of them deriving from Hebrew’s daily contact with Aramaic, another language of the region. It added to Hebrew such terms as ilan (tree), hazar (returned) – different from their equivalents in biblical Hebrew – as well as words that are unattested in biblical Hebrew, such as kavveret (beehive) and gesher (bridge). Medieval Hebrew, a written language that flourished among Jews in both Muslim and Christian lands, added such words as ekhut (quality), as well as a number of terms borrowed directly from Arabic, such as ta’arikh (date). New words created in Medieval Hebrew poetry are also in use in Modern Hebrew, such as ma’as (action, deed) and mivhan (test). Modern Period – starting with the rise of modern Hebrew literature in the mid-18thcentury onward, and especially since Hebrew’s revival as a spoken tongue in the early 20th century, Hebrew has had to face the continual challenge of adapting to modernity while trying to preserve the ancient spirit of the language. New terms to fit modern society and technology had to be wrested from old roots and paradigms. Some of these innovations were created by individuals on their own initiative, while others originated thanks to institutions, in particular the Hebrew Language Committee and its successor, the Academy of the Hebrew Language. The Academy established the Historical Dictionary Project, which seeks to preserve and catalogue treasures of Hebrew throughout the ages. The Modern Hebrew language is still a work in progress, a vigorous new idiom growing out of ancient roots. The center of the stamp features a seedling whose leaves spell the word Ivrit (Hebrew). Its roots consist of all the earlier layers of our language found in four principal sources – the Bible, rabbinic literature, medieval writings, and Modern Hebrew. Biblical Hebrew is represented by an ostracon dating from the 7th century BCE and inscribed in ancient Hebrew script. The seedling’s root that derives from it (third from left) features the words: mishpaha (family), ahava (brotherhood), nefesh (soul, spirit, throat), mafteah (key), tsedek (justice), merkava (chariot), deror (liberty), kazav (untruth), ra’am (thunder) and kefir (lion cub). Mishnaic Hebrew is represented by a parchment scroll featuring a Mishnaic passage, reflecting the Hebrew that was spoken in Eretz Israel in the 1st and 2nd centuries CE. The seedling’s root that draws on this level of the language (represented by the parchment) rises to the right of the biblical root and features the words: keneset (assembly, parliament), ilan (tree), gesher (bridge), tinok (child, baby), lakoah (customer), kavveret (beehive), and hotem (nose). Medieval Hebrew is represented by bound codices with bindings typical of the period. The root rising out of them (second from left) features the words: ekhut (quality), kammut (quantity), shelemut (completeness), ta’arikh (date), ofek (horizon), koter (diameter), lahan (melody), hashva’a (comparison) and mivhan (test). Modern Hebrew is represented by a computer keyboard, today’s alternative to the book. The roots deriving from it (on the far left and right) feature new words: havaya (experience), hamtsan (oxygen), misron (text message, SMS), adivut (courtesy), monit (taxi); mahshev (computer), taklitor (CD), midgannim (cereals), mir’ash (sensation); nevita (germination) – the word that appears on the stem. The phrase at the bottom of the stamp, “Ancient Language in a New Reality”, was coined by Professor Ze’ev Ben-Hayyim, a prominent Hebrew linguist and one of the founders of the Academy of the Hebrew Language, serving as its president from 1973 to 1980. This phrase is taken from the title of his 1953 article, in which he discussed the special character of Modern Hebrew. According to Ben-Hayyim, “the unique characteristic of Hebrew is not changes in meanings of words (as is typical of every language)… but rather its uniqueness lies in the fact that nothing was lost… thus our language has… multiple layers alongside each another and not atop one another as in the case of other languages that have continued to exist over time”.